(Seychelles News Agency) - Seychelles is on track to establish a European Union-funded Operation Coordination Centre to promote maritime security, after the Indian Ocean archipelago of 115 islands received regional backing for the proposal from the Common Market for Eastern and Southern Africa (COMESA). According to a press statement issued on Sunday by the Seychelles Ministry of Foreign Affairs (MFA), COMESA has “expressed its support for a bilateral agreement between Seychelles and Madagascar on the establishment of two maritime centres” during the 14th Meeting of the COMESA Ministers of Foreign Affairs held in Addis Ababa, Ethiopia on Saturday, March 28. The statement says that the Seychelles Secretary of State for Foreign Affairs, Ambassador Barry Faure, told COMESA members that an agreement had been reached recently “following numerous discussions between the involved parties” regarding the establishment of an Operation Coordination Centre in Seychelles to combat maritime insecurity, and a Maritime Information Fusion Centre in Madagascar. The centres are to be financed under the Maritime Security Programme (MASE), a European Union-funded initiative that promotes maritime security for the region of East and Southern Africa and the Indian Ocean (ESAOI), costing 37.5 million Euros ($40.7 million). “The Mauritian Foreign Minister, Mr Etienne Sinatambou, strongly expressed his support of the agreement, and called for the establishment of a legal framework for data storage and sharing based on international standards,” read the MFA statement. Applications will now have to be filed with the Indian Ocean Commission (IOC) Secretariat by both Madagascar and the Seychelles, which has the mandate to establish the centres. In an email interview with SNA, Raymond St. Ange, the Ministerial Advisor to the Minister of Foreign Affairs, Joel Morgan, said that it was MASE’s original plan to host the maritime safety centre in Madagascar, but that presidential consultations at the 4th Summit of the Indian Ocean Commission in August 2014 led to a vision of shared cooperation between Madagascar and Seychelles. According to St. Ange, it was agreed to establish a Maritime Information Fusion Centre to help detect risks to maritime safety and a regional Operation Coordination Centre to conduct joint maritime operations. “The President at that meeting on the sidelines came to an understanding with President Hery Rajaonarimampianina on how best to approach the question of the centre being located in Madagascar, considering that Seychelles already had a functioning centre with growing capabilities,” said St. Ange. The final agreement to base one centre in Madagascar and one in the Seychelles was made during the AU/EU Maritime Ministerial meeting on February 8 and 9. At the COMESA Foreign Affairs Ministers meeting, piracy was one of the key peace and security challenges addressed, with Seychelles today earning high praise from regional ministers for its role in the arrest and prosecution of pirates as well as the contribution of the Regional Fusion and Law Enforcement Centre for Safety and Security at Sea (REFLECS3), which is based in the Seychelles, towards maritime security. 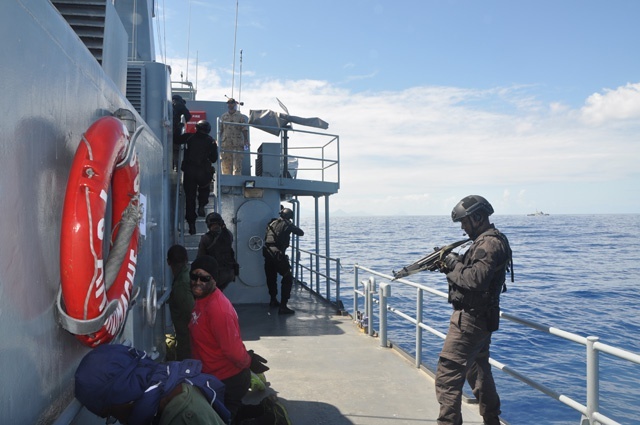 The Seychelles government recently transferred nine convicted Somali pirates to serve the remainder of their sentences in Somalia, bringing the total number of convicted pirates repatriated to their home soil to 90. “The repatriation has mostly been because the prison space in Seychelles has been increasingly overcrowded with convicted or suspected pirates since Seychelles started to try and imprison pirates,” stated a report adopted by the meeting, which praised Seychelles, Mauritius and Kenya for their role in fighting piracy in the region. The Kenyan Foreign Secretary, Ambassador Amina Mohamed, also reported that she had been “impressed” by her visit to the REFLECS3 facilities in Seychelles last year, describing it as “a welcome addition to the efforts that Kenya has taken in the fight against piracy, especially in the prosecution of pirates”. The Seychelles delegation responded to the praise by warning against complacency, noting the need to keep up an international presence in the region. “Whilst the Government of Seychelles commends the efforts of actors like the EU naval operation ATLANTA, EUCAP Nestor and the operations of AMISOM, we request that the international forces be maintained until such a time that stability and normalcy is restored in Somalia,” said the delegates. Piracy around the Horn of Africa, which affected container ships, fishing vessels and cruise ships traversing the strategically important location, has been significantly brought under control since its peak in 2009, with only two failed attempts in 2014 and no activity recorded in 2015 until the recent hijacking of an Iranian vessel, suspected to have been fishing illegally in Somalian waters.